Free expression withstood a wide range of attacks in 2017. Thanks to donors like you, CBLDF was at the forefront, protecting our community from an increasing tempo of challenges to comics and other expressive material. From deploying our lawyers to help comics creators to counseling educators and librarians in censorship crises, CBLDF was on the case. Our efforts in the courts helped prevent unconstitutional laws from taking effect, while our advocacy spoke powerfully for the rights of our community. We also stepped up our education work, creating a new Retailer Rights Workshop program, training comic store staff about how to protect their rights, alongside our vital publication program. We’re proud to share this important work with you in our 2017 Annual Report, which you can read in full below. 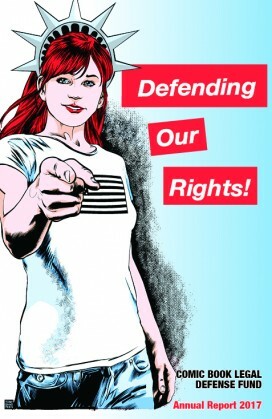 These are embattled times for the First Amendment, and CBLDF’s work is essential to preserving the rights it guarantees the comics community. Please help us advance this important work by making a tax-deductible contribution today!